You lack the time and energy, required to properly maintain your lawn at its best? If so, you have come to the right place as we are dedicated to providing bespoke, affordable and professional grass cutting services to private, state and commercial properties in Notting Hill and the vicinity. We will help keep your lawn looking great, healthy and dense, just like it’s supposed to. We are committed to satisfying our customers in every respect possible, which is why we charge moderate rates, offer free quotes and employ experienced professionals. Your lawn is the centrepiece of your property and as such, requires constant care and attention. Often times, it is your busy schedule that prevents you from taking proper care of your lawn’s grass. Or maybe you lack a professional lawn mower to get the job done effectively? Either way, we can be of great help as we possess both the expertise and the cutting-edge equipment to allow your lawn to live up to its full potential. Once our team of seasoned gardeners reduces the grass in your lawn to the desired height, they will proceed with detailed trimming of the grass around the lawn’s edges. The areas around trees, arbours, walls, pathways and driveways will also be diligently edged. Weeds will be dealt with accordingly, yet our gardeners will spray the green areas with specialised, eco-friendly repellents to keep pests at bay. The clipped grass will be either disposed of or added to your compost upon request. If you like what we have to offer, get in touch with us over the phone, via email or by filling in our form. 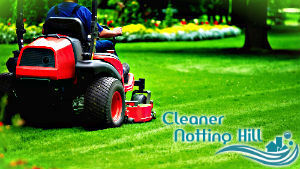 Our excellent grass cutting services in Notting Hill are available throughout the week.